← New Guide Offers Architectural Walking Tours Of Princeton U., Seminary, Institute of Advanced Study. 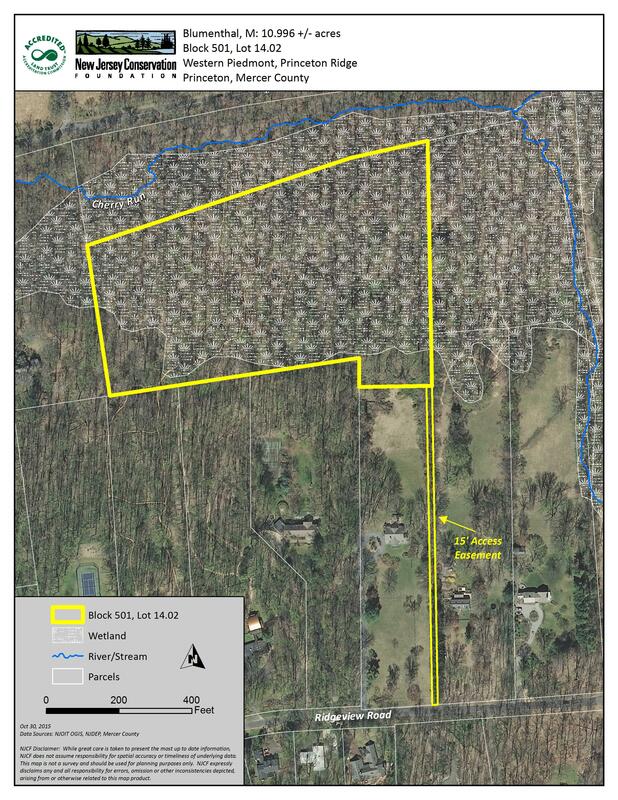 Last month, the New Jersey Conservation Foundation acquired a new area of open space in Princeton. Approximately 10 acres of forest were donated by Michael and Barbara Blumenthal, from around the back of their home off Ridgeview Road. This land will now be off-limits to development, and open to the public. The map above shows where the new open space can be found. The new open space lies between Cherry Valley Road and Ridgeview Road, just south of the Cherry Run stream, and west of the new Transco pipeline. Although rough trails apparently exist on the property, which afford excellent opportunities for observing migratory birds, the land is not currently accessible. Future access is intended to be via a narrow right-of-way along the edge of the property at 227 Ridgeview Road. New trails are planned to provide public access to the land at the Blumenthal tract in the coming years. The New Jersey Conservation Foundation, which is the new steward of the land, is one of several organizations that manage open space in Princeton. The Foundation also owns the Ricciardi Tract, part of the ‘Princeton Ridge Preserve’, near Bunn Drive. No trails cross the Ricciardi Tract, but a municipal sewer line access trail runs next to the land and also connects to trails in the All Saint’s Preserve. This entry was posted in Princeton, Trails, Walking and tagged open space, preservation, Princeton, trails. Bookmark the permalink.